Bank of England Financial Policy Committee member engages audience with insight into committee procedure and structure. 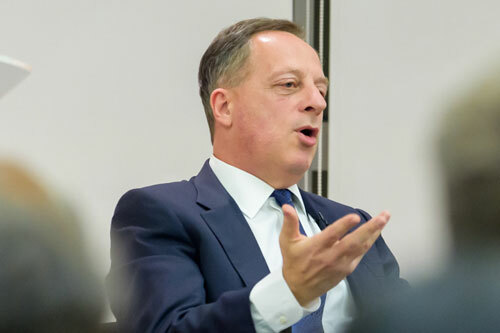 Scores of people from a variety of professional backgrounds poured in to Cass Business School to hear Mr Richard Sharp deliver his speech: Central bank independence as a prerequisite for financial stability. After being welcomed to the School by the Vice Dean, Professor Paolo Volpin, Mr Sharp showed he had done his homework, referring to a paper Professor Volpin produced in 2001. “Your analysis then that economic growth is dependent on understanding effective financial regulation was prescient and is as relevant now as it was then,” Mr Sharp said to Professor Volpin. Mr Sharp then presented the audience with his views on the importance of central bank independence with regard to both monetary and financial stability. “Central bank independence is a concept which has widespread global adherence; it is the foundation of monetary stability in Europe, the US, and elsewhere,” Mr Sharp said. “Given interconnected capital markets and spill-over effects, this has undoubtedly contributed substantially to global monetary stability. As defined by the Bank of England, it is the remit of the Financial Policy Committee (FPC) to identify, monitor and take actions to remove or reduce systemic risks with a view to protecting and enhancing the resilience of the UK financial system. During his speech Mr Sharp Explained why, six years after it was formally established, the structure of the FPC is still “not only effective, but optimal”. He said the committee, with its six Bank of England members, five external members and representatives from both the Financial Conduct Authority and Her Majesty’s Treasury, was accountable for its deliberations and said members routinely testify to the Treasury Select Committee. “The FPC functions well. I’ve seen it assess and analyse risks from the banking sector, Scottish referendum, Brexit risk, the Europe crisis, cyber risk, and domestic credit creation,” Mr Sharp said. A complete transcript of Mr Sharp’s Speech is available on the Bank of England website.